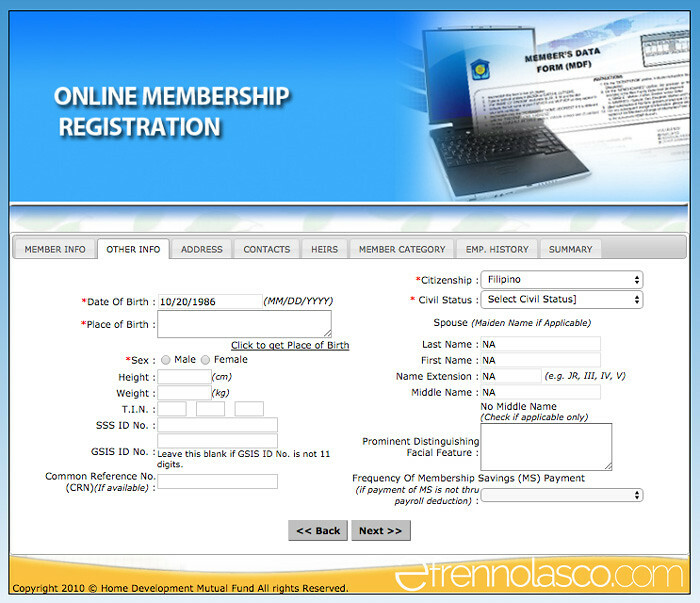 If you don’t have Pag-IBIG MID number, you will need to register online to get the number. 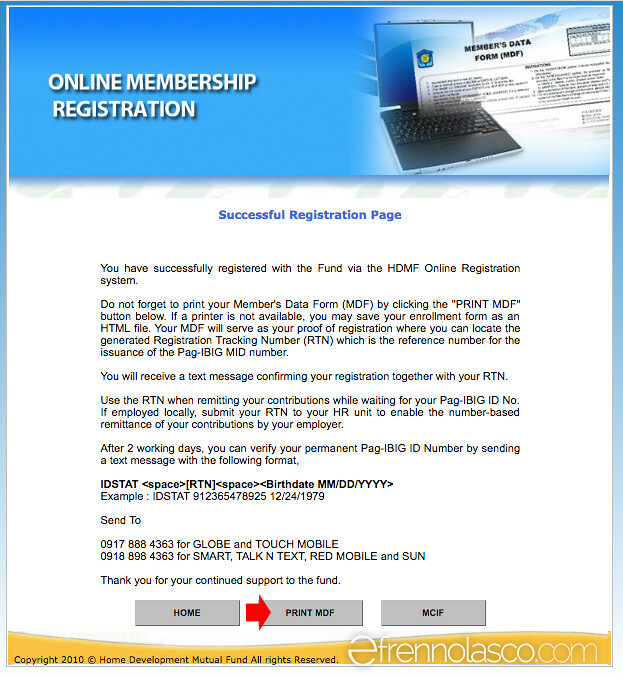 We will walk you through every steps in the Pag-Ibig online registration in this article, all you have to do is follow every steps that you can see below. Step 1. 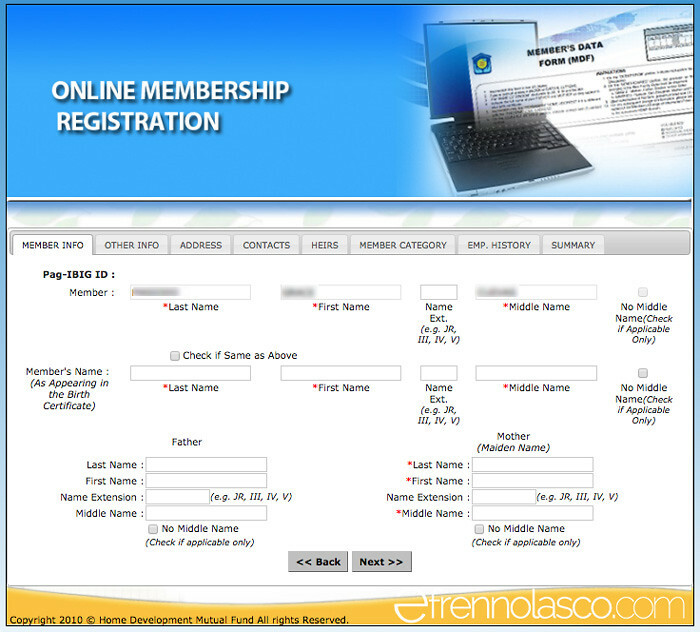 The first step is to go to the Pag-IBIG Online membership registration page that you can access in this link. 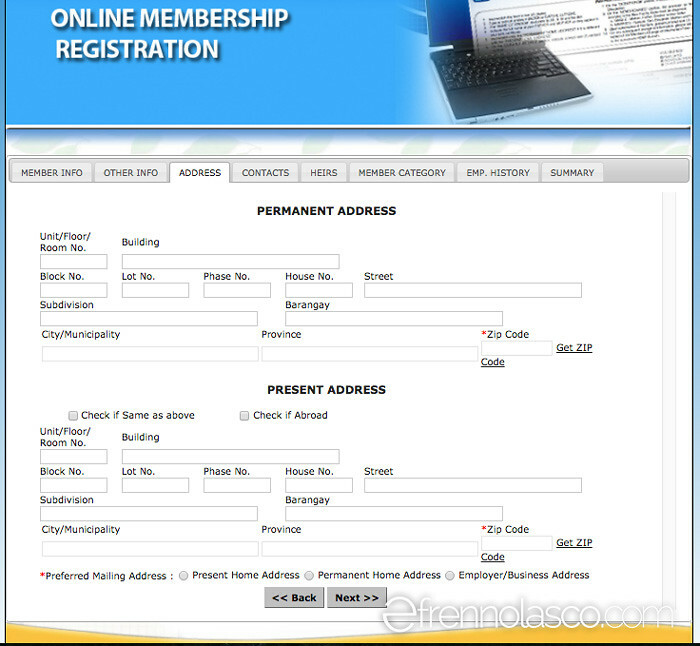 You will arrive on a page where you need to enter your name and birthdate like the screenshot that you can see below. Click proceed to continue. Step 2. Next you will need to complete your personal information which include your parents name that include in member info tab. Step 3. 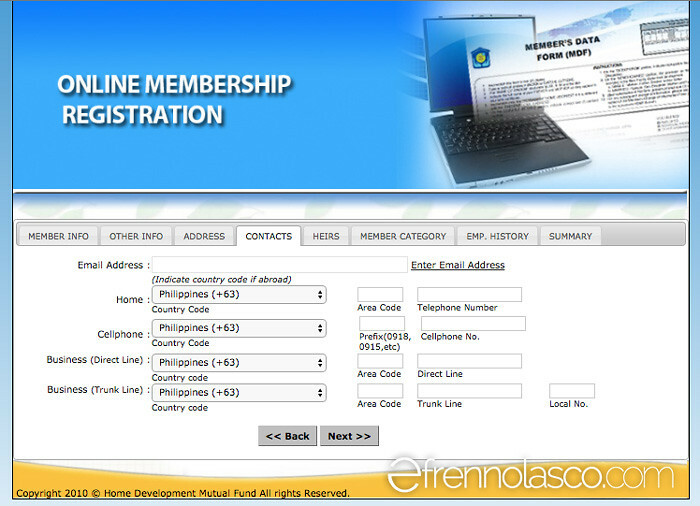 In the other info tab of the Pag-IBIG online membership registration page, you will need to supply the place of your birth, citizenship, civil status, height, weight, etc. Step 4. Next is the address, if your current address is different from your permanent address, you may need to indicate in the section. Step 5. Enter your contact numbers in the contact tab. Step 6. 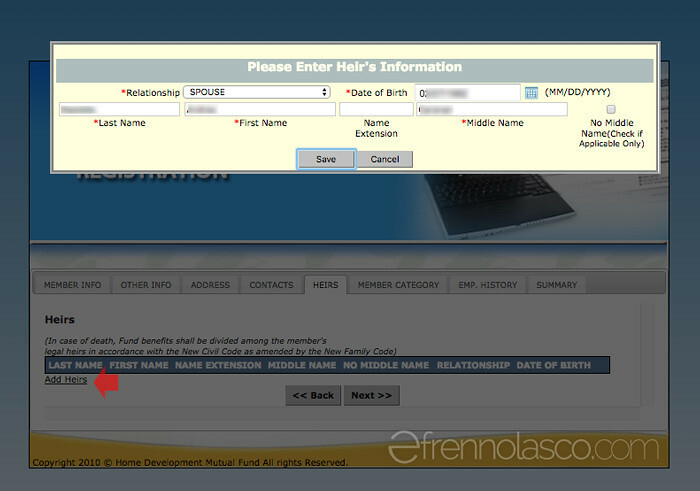 In the heirs tab, add the name of your relative, if you are married you can add your spouse. In case something happen to you they will receive the benefits. Step 7. 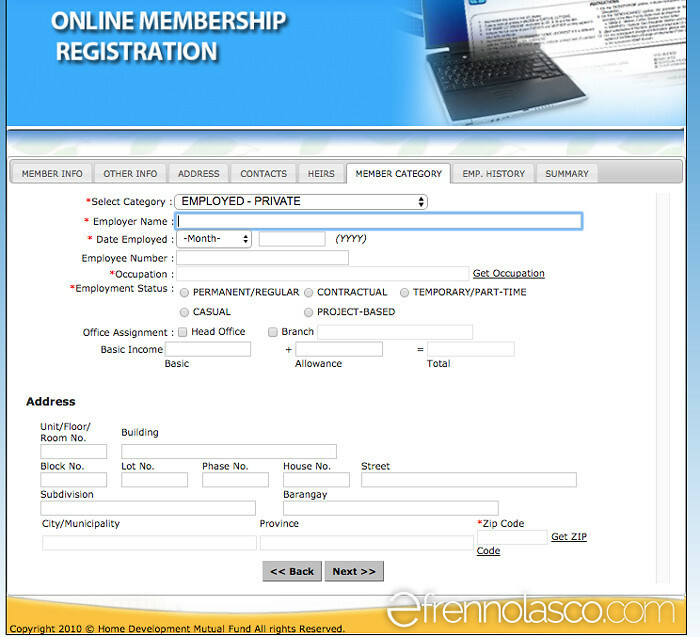 Select the member category, if you select employed, enter the employer name, date employed, occupation title, your employment status, etc. Step 8. 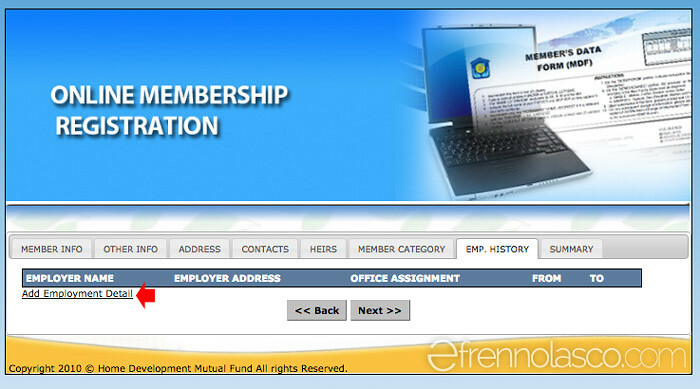 If you previously employed, you can add your employer in the Emp. History section, you can leave it if you’ve nothing to add. Step 9. In the summary section it will ask for your confirmation to all the information that you entered before clicking the “Submit Registration” button. Step 10. 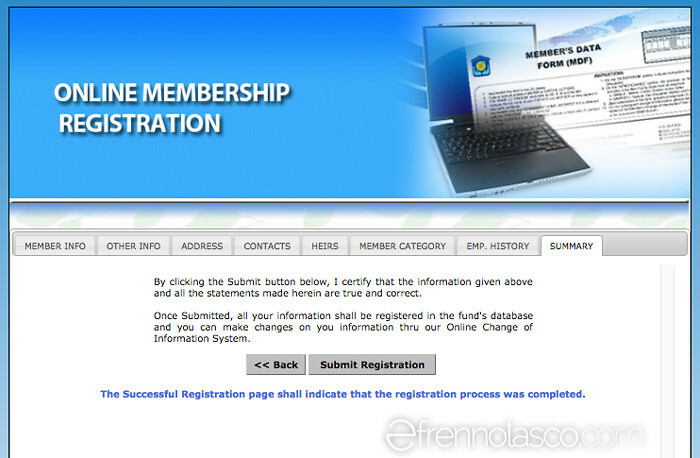 Once the registration is successful you will arrive to “Successful Registration Page”. 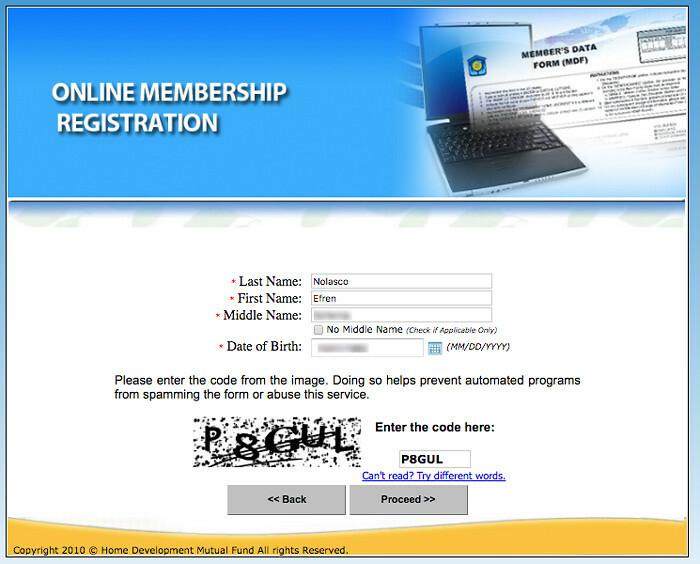 Read the instruction carefully, the number that you get is the Registration Tracking Number (RTN) only. You will get your permanent Pag-IBIG ID number after 2 working days but you can use the RTN while waiting for the permanent ID number. After 2 working days you can verify your Pag-IBIG ID number thru text by sending the RTN number and your birthdate in this format. We hope this instruction help you to register in Pag IBIG online registration and enjoy the benefits of this institution later when you needed it.